Design and integration for the worlds second NipcoFlex / EcoSoft calender – enhancing material properties, reducing raw material consumption, increasing profitability and market penetration. To remain competitive, a world class liquid packaging manufacturer needed to improve product quality and reduce raw material consumption. 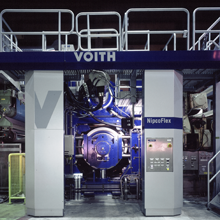 An innovative combination NipcoFlex / EcoSoft calender stack was selected  this being the second installation worldwide. More complex than traditional calenders, this system comprised 3 primary equipment providers from different countries (England, Germany, Japan) each providing their own individual control system to mitigate risk. These systems required seamless integration with the existing DCS – from the operators perspective, the calender controls appear as one unified system. Communication throughout the design phase was critical to ensure coordination of control strategies and ultimate performance of the calender. Onsite systems integration and commissioning went according to schedule. Performance of the calender exceeded expectations. In addition to surpassing new material property specifications, raw material consumption was reduced allowing production speed increases – improving profitability and market penetration.